I do more than half of my pet shopping at Amazon. The site carries so much variety in foods, supplements, toys, habitats, and even pet clothing and costumes. If there's something I'm not sure about, I depend on the reviews of other pet owners to steer me in the right direction; when all the customers rate an item with 5 stars, I'm pretty sure to get a quality item. So, I did some searching on Amazon to find the highest ratings in 10 popular cat 'cat'egories to share with you. Here are what Amazon customers think are some of the best products for your cats. 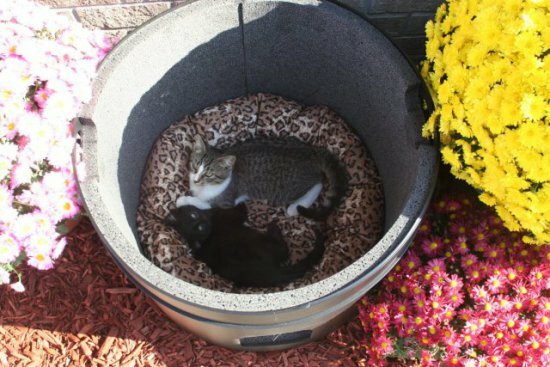 The Kitty Tube has been the favorite outdoor cat house of Amazon customers for several years, but now that it's been outfitted with even more comfort-providing upgrades in 2016, it's better than it was before. This is the most user-friendly cat house you'll ever find. The Kitty Tube is fully insulated and is built for warmth in winter and coolness in summer, with air vents that can be opened or closed depending on the weather. You don't need to worry about odors or mildew within The Kitty Tube; its materials and design naturally resist them, and all parts, even the insulation, are easily washable. The Tube fits up to 3 cats comfortably and comes with a cat bed. There is even a cat bed option for feral cats, who apparently prefer straw to foam. And The Kitty Tube is green! It's made of 100 percent post consumer content consisting of recycled milk and detergent bottles. Go green with The Kitty Tube at Amazon.com. Now here's a cat tree with a whole lot of cat and cat owner fans. More than 4,000 cat owners have written sterling reviews of the Go Pet Club Cat Tree on Amazon. And there are many customer images and videos posted for this tree house, some with several cats playing on the tree at the same time! Now, that's a fan club! The Go Pet Club Cat Condo is a super playground with two hiding places and plenty of rest stops, sisal scratching posts, and even a few mice to bat around. Its total measurements are 50"W x 26"L x 72"H. The Go Pet Club Cat Condo comes with beige (above) or blue carpeting (more expensive); you have to assemble it, but it's not hard. See them both at Amazon.com. 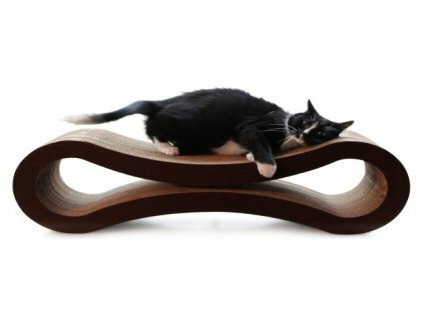 Here's a cat scratcher made for cats who love to stretch, and what cat doesn't? 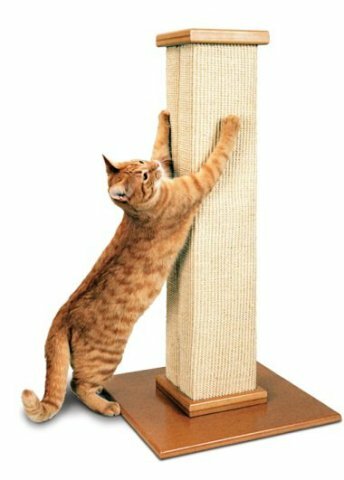 The SmartCat Ultimate Scratching Post is the ultimate because it's tall (32"), it's got sisal scratching material, and it's got a solid, sturdy base that won't let the Scratching Post wobble while kitties scratch. My cat definitely prefers the sisal, compared to carpeted scratchers; it's tougher and, from my perspective, it doesn't leave tufts of carpet fiber all over the floor. The great (my cat loves his!) 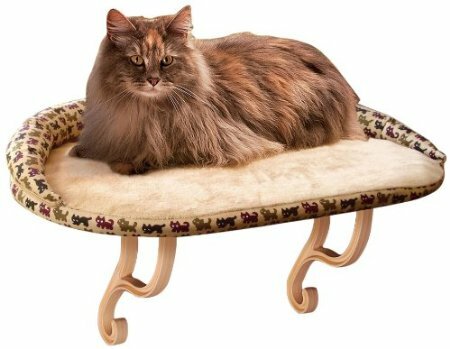 SmartCat Ultimate Scratching Post is available at Amazon.com. 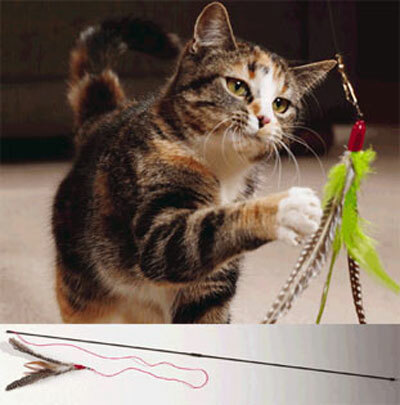 For years now, Da Bird has been the best selling cat toy. It's the feathers, the wand, the interactive qualities of Da Bird...probably all three. I don't know, but I can vouch for it because it is also my cat's favorite interactive toy. This Da Bird is sold with replacement feathers - your cat will need them. A nice wide bowl for your cat and a steady supply of dry cat food for your own convenience. Unless your cat needs to diet, the Petmate Gravity Pet Cafe Feeder is a dream - and it's not expensive like the programmable cat feeders. Also, it's a perfect feeder for multiple cat families. Truthfully, self cleaning cat boxes are still in their infancy, efficiency-wise. There is no perfect self-cleaning cat box. 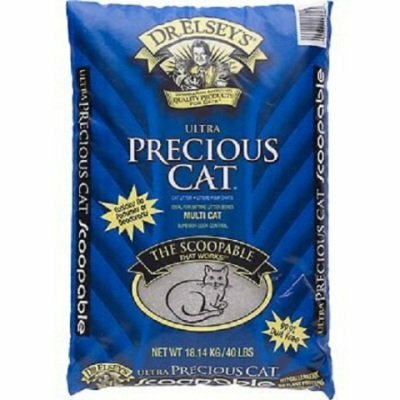 But there are some good ones, and the Omega Paw Self-Cleaning Cat Litter Box is a top seller. It has 7,000 customer reviews on Amazon alone! The design of the Omega Paw is simple, and it's technology is simple too. It requires no motor, no electricity, and no batteries. It even requires less kitty litter than other litter boxes. It is easy to use, easy to clean, and easy for kitty to get in and out of (note the large opening). And here's how it works! Remember, you have to acclimate your cat to a new litter box and you have to keep the box clean (don't forget about cleaning the inside of the lid). Here's another product that I can vouch for. 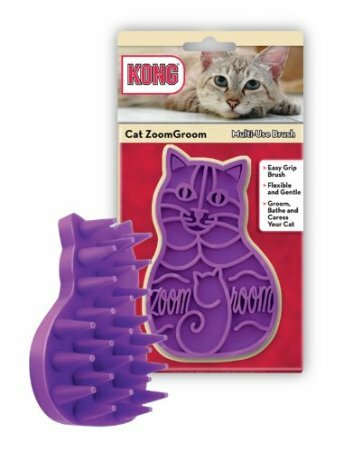 The Kong Zoom Groom is made of a solid piece of rubber. Its spikes are thick and rounded at the tips, so they feel more gentle than the steel spikes of most cat brushes. Yet, the Zoom Groom is just as effective at removing dead hairs as the steel brush. Its effectiveness may have as much to do with the static it creates when it rubs against your cat's fur, as from the brush's tines, which are rather far apart. Hairs clump together and are easily removed from the Zoom Groom. 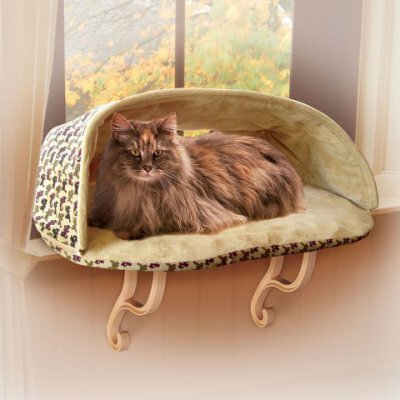 A sturdy, soft, and cozy cat sill with bolster or hood, the K&H Kitty Sill Deluxe offers a perfect kitty view from a height she'll love. This cat sill requires no tools to mount! This three-pronged Prosper Pet Cat Tunnel is a great hideout for cats and even smaller critters, like rabbits. As you know, your cat can entertain herself for hours in a tunnel, but this one has arms where she can hide and even peek out. 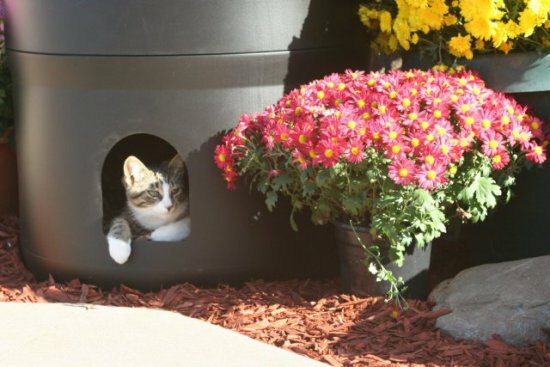 The Prosper Pet Tunnel has more than 1200 great reviews, so you're not going to lose, especially not with sturdy metal rims and sturdy nylon offering your cat 10 feet of space to play. The Prosper Pet Cat Tunnel folds up completely for storage, comes in 10 colors, and it's washable! I'm stretching this column out a bit to include an item that has 5,000 positive reviews; how can we pass that up? It's the PetFusion Ultimate Cat Scratcher Lounge, a great looking combination scratcher and lounge. Unlike many cat scratchers than work well but don't look great in the house, this sinuous piece is really sleek and modern looking and attractive enough (when not worn out) that you don't have to hide it away when guests visit. It is made of high quality cardboard designed for about a year's worth of use. The durability and quality of the product is excellent and my cat really loves sleeping on it with his paws clicked into the grooves. You can read the rave reviews and buy it here. Well, that's my list of best selling cat products on Amazon. They are best sellers for the best of reasons; they work. If you have other products you think work very well, please share them with our readers in the comments section below.